Miami is known for many things. The weather, of course, will make those living in other areas of the country quite jealous during the winter. The city is also known for its NBA team, the Miami Heat, which is expected to challenge Cleveland in the East this year. 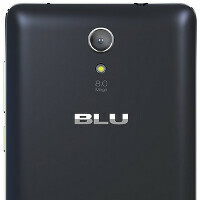 And of course, Miami is the home of smartphone manufacturer BLU. The company has been churning out smartphones under the radar, but if you need a phone that can last up to four days before jonesing for a charge, you might want to give BLU a shot. Two new models have been released, both with larger than average juicers inside. The BLU Studio Energy 2 features a 5-inch screen with a 720 x 1280 resolution. A MediaTek SoC is under the hood, containing a quad-core 1.3GHz CPU. 1.5GB of RAM is inside, along with 16GB of expandable native storage. The camera combo from back to front weighs in at 8MP/5MP, and a huge 5000mAh battery keeps the lights on for as long as four days of standard use between charges. The cell provides 45 days of standby time. There is dual SIM capabilities on the phone, which measures 10.16mm thick, thanks to the power plant. The BLU Studio Energy 2 can be purchased from Amazon (click on the sourcelink) for $179. Your color options include Midnight Grey or Ceramic White with Rose Gold. The unit supports 4G connectivity, and works on all U.S. GSM carriers including AT&T and T-Mobile. If your budget calls for something cheaper, the BLU Studio Energy X can be purchased from Amazon for $109. This handset comes with a 5-inch screen, once again carrying a 720 x 1280 HD resolution. The MediaTek chipset on board comes with a quad-core 1.3GHz CPU and a Mali-400 GPU. 1GB of RAM is inside, along with 8GB of internal storage. Those seeking more memory can access the 64GB capacity microSD slot. An 8MP camera adorns the back of the phone, while a 2MP shooter graces the front. The unit supports 4G connectivity, and is compatible with all U.S. GSM carriers including AT&T, T-Mobile, Cricket, MetroPCS, Straight Talk, Pure Talk and others. Make one with Snapdragon 615, 1080p screen, and 2gb of RAM and then we'll talk. That's Lenovo Vibe P1 for you.